Anthony, 1, lives in Amrington, Ill., and according to his mom, has fought developmental delays, congenital heart defects and seizures. "He has another surgery coming up on Thursday, and his cape will be close by, helping him fight through!" his mom, Jacqueline Durham, said. UPDATE, April 18: Ten of the youngest victims of the Boston Marathon bombing will receive superhero capes, made by Robyn Rosenberger and donated by Zaarly.com, an online marketplace. Read on to find out how Tiny Superheroes got started. 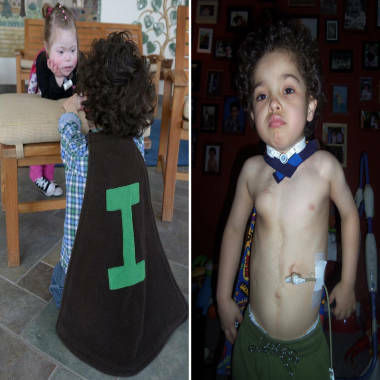 Super Isaac, sporting his Tiny Superheroes cape, was born with an incomplete esophagus, but "his strength and resilience are unmatched," said his mom, Kimberly. Many people follow blogs for advice, laughter and inspiration. Sometimes the stories we read are so powerful they inspire us to act. In the case of Robyn Rosenberger, those powerful stories made her want to sew. The Seattle mom was making superhero capes for her 1-year-old son when she came across a blog about a baby girl named Brenna. Brenna was born with a rare and severe skin disease. She needed eye surgery at just 3 weeks and beat an aggressive blood infection. In Robyn’s mind, Brenna was a fighter: She was Super Brenna. “I realized that while my son looked cute in a cape, Brenna needed a cape,” Rosenberger said. So she reached out to Brenna’s mom, Courtney Westlake, who lives in Springfield, Ill., through Facebook, and asked if she could send a cape her way. Super Brenna's story was the first to inspire Rosenberger to start crafting capes for other kids. “She was ecstatic and told me that they have been calling Brenna their superhero since she was born,” said Rosenberger. That was the moment TinySuperheroes was also born. Within a month Robyn’s Singer machine pumped out 80 capes. 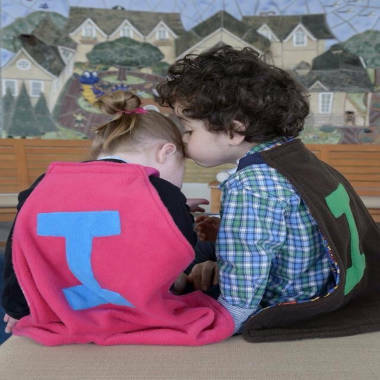 In the last two months the colorful cloaks have empowered more than 100 kids nationwide, many of whom are fighting illnesses that are undiagnosed, terminal or don’t have a cure. "When Brenna was first born, my husband's aunt told us that she was initially afraid to see a photo of her because of her severe skin condition," said Westlake. "But she told us that despite Brenna's startling thick plaques of white scaly skin and flipped-out eyelids and mouth, she saw a little superhero. 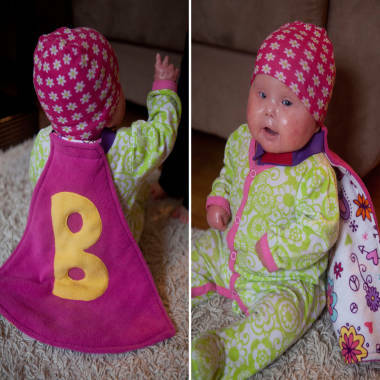 So when Robyn contacted me with her idea to make a superhero cape for Brenna, I thought back to when Brenna was just three days old and already a superhero in the eyes of our family, and I was excited to share with others about the super powers that Brenna has displayed in her 15 months of life." How does Rosenberger find the kids who need her handiwork? It’s easy, she said; they find her. Social media and Facebook have allowed Tiny Superheroes to share incredible stories. Once the child is comfortable in the new cape, his or her pictures and story are featured on Robyn’s blog. She hopes it gives them a voice and their condition a face. Many of these kids' pages have 10,000 or more "likes" on Facebook, and for most families, social networking is a big source of advocacy and support. Jacqueline Durham, mom of "Super Anthony," says his cape has increased awareness of how hard he and kids like him fight every day. Anthony, 1, has developmental delays, a heart defect and seizures. 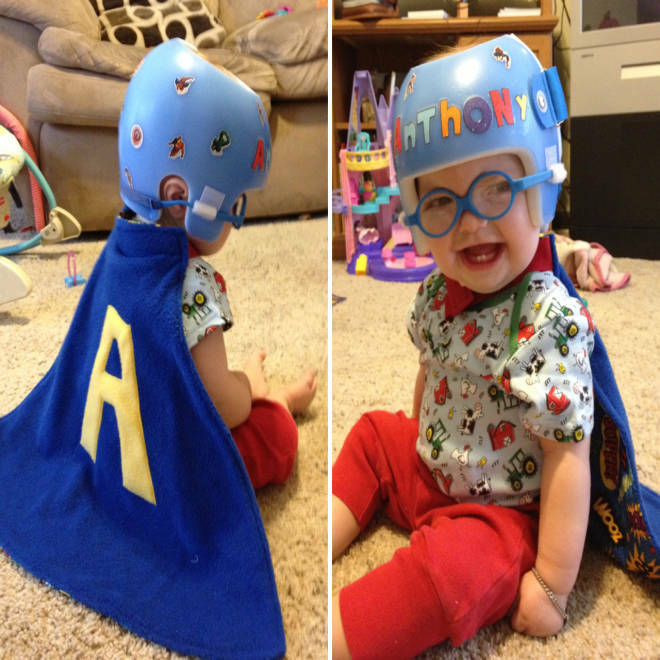 "Anthony will always be my superhero!" Durham said. His next surgery is scheduled for tomorrow, April 18, and his mom said, "His cape will be close by, helping him fight through." Ireland, 5, and Super Issac, 4. Isaac Crawley was born nine weeks early with a birth defect called esophageal atresia, or incomplete esophagus. "We started calling Isaac 'Superman' before he was born, because we knew he would need the strength of Superman very early in his life," said Kimberly Gould Crawley, mom of "Super Isaac," 4, in an email. Isaac needed a tracheotomy because his vocal chords were paralyzed from several early surgeries. He spent 11 out of his first 13 months in intensive care. He was kept paralyzed and sedated while an esophagus was grown inside his body. He has undergone 21 major surgeries in four years, and hospital stays are a regular occurrence, said his mom. "He never gives up; he never complains," Gould Crawley said. "His smile can light up a room." Gould Crawley, who lives in Ashburn, Va., was "thrilled" when Rosenberger contacted her. "How amazing is it that someone else sees Isaac for the superhero he is?" 100 more caped crusaders are in line to be featured on Rosenberger’s blog. When she’s not profiling these superhumans-to-be, she’s stitching away for future heroes. Response has been so big the mom-on-a-mission has enlisted sidekicks: girlfriends who find fun in sewing around the dinner table.